Facebook has updated its Messenger app with some new features today. The social networking giant has added a new feature to the app. The app has been updated with two new features, one of which is admin privileges which provides the group admin a lot of control over the group conversations and the group members. The second feature is that there will be joinable group links which user can share to let any Facebook user directly join the group. Both of these features are coming to the Facebook Messenger app on both Android and iOS. The Admin Privileges feature allows the administrator to approve new members to join the group chat. 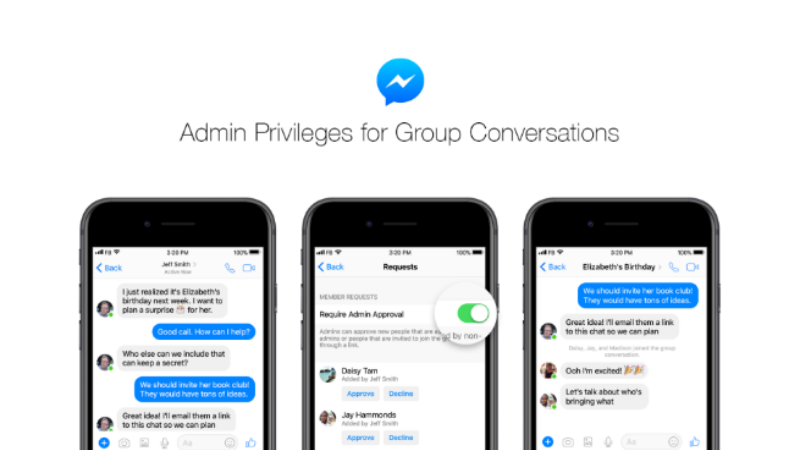 Facebook said that this feature will help the admin to control large group chats. The admin can also remove any member from group chat if he wants. Another thing about the Admin Privileges feature is that the Messenger app has an option to enable or disable the admin rights. To enable it to go to the Messenger app, Settings and disable it from there. The next feature which Facebook pushed is the joinable link feature which enables the users to share a direct group joinable link to other users. And if the admin privileges are turned off from the admin then the user can enter the group without the need for an approval from the admin. These two features are similar to what WhatsApp has from quite a while now. However, the admin privileges feature is not released on WhatsApp yet.